FEMA’s leadership admitted it "could have better anticipated" the severity. No tarps, no cots and fewer than 200 blue roofs. That is what the Federal Emergency Management Administration’s warehouse in Puerto Rico looked like as Hurricane Maria made landfall in Sept. 2017. The vital supplies had been siphoned off elsewhere when Hurricane Irma had slammed into the U.S. Virgin Islands, prompting a need for assistance. In its after-action report (AAR), FEMA’s leadership admits it “could have better anticipated that the severity of hurricanes Irma and Maria would cause long-term, significant damage” to Puerto Rico and the U.S. Virgin Islands. FEMA pointed out that Puerto Rico’s government has not yet achieved a level of preparedness commensurate with much of the U.S. mainland. In the first 72 hours after Maria’s landfall, FEMA had “little information” about the status of the island’s infrastructure. A week after the storm, FEMA still lacked key information, including vital details like the status of more than half of the island’s water treatment facilities and nearly half of the island's hospitals. Hurricane Maria hit Puerto Rico on the morning of Sept. 20, 2017, plunging the island into complete darkness, causing $100 billion in damage and claiming the lives of countless people. In the wake of Hurricane Irma, FEMA moved more than 80 percent of its inventory from the Caribbean Distribution Center warehouse in Puerto Rico to the Port of St. Thomas in the U.S. Virgin Islands. That left the only FEMA warehouse in Puerto Rico with no cots or tarps, less than 98,000 meals and less than 70,000 liters of water -- all as Hurricane Maria barreled towards the island. In a letter attached to the report, FEMA Administrator Brock Long wrote that “the hurricanes also showed that governments need to be better prepared with their own supplies, to have pre-positioned contracts with enforcement mechanisms, and to be ready for the financial implications of a disaster." The FEMA report cites the island’s geographic distance from mainland U.S. as well as its fiscal pressures for its lack of critical infrastructure management and decreased funding for emergency management. The report also pins blame on an agency they say “entered the hurricane season with a force strength less than its target, resulting in staffing shortages across the incidents.” The agency needed more than 1,000 more people to hit a target set for the fiscal year. 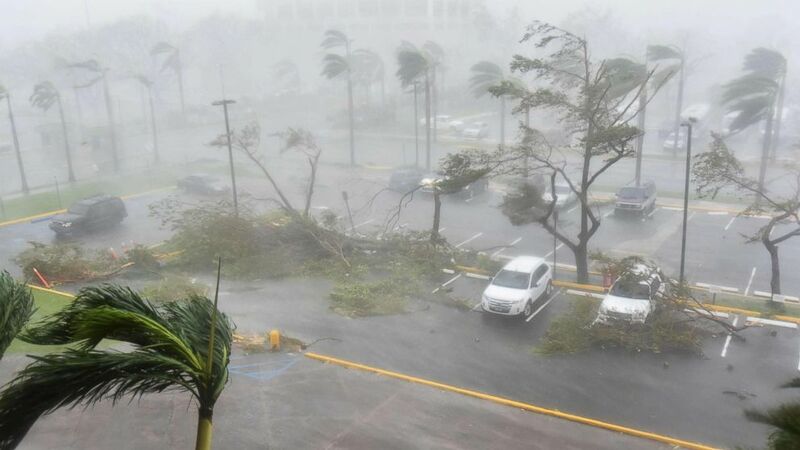 (Hector Retamal/AFP/Getty Images) Trees are toppled in a parking lot at Roberto Clemente Coliseum in San Juan, Puerto Rico, Sept. 20, 2017, during the passage of the Hurricane Maria. In the aftermath of Maria, FEMA’s Logistics Supply Chain Management System records that tracked much-needed food and water supplies in real time lagged because of a lack of trained personnel on the ground. Less than a fifth of the trained staff were in Texas and Florida responding to other hurricanes. In a little over a month, the federal agency responded to three major hurricanes -– Harvey, Irma and Maria -– which did a combined $265 billion in damage. Maria represents FEMA’s longest sustained air mission of food and water delivery to date. FEMA also acknowledges that the agency's reliance on cellular and broadband communications fell remarkably short of facilitating vital communications between rescuers and survivors during some of the most consequential early days of the storm for Puerto Rico. Among a number of such issues, some of the satellite phones that were sent to Puerto Rico did not work, and many who received those phones did not know how to use them. The Puerto Rico Federal Affairs Administration released a statement late Saturday night which said things could have been done "much better" following hurricanes Irma and Maria. "FEMA did a good job on many fronts and it's still doing [so], but it would be unwise to say there weren’t mistakes. There were mistakes and many lessons to be learned. This is what the AAR is for, to help find those mistakes and that FEMA is publishing their mistakes indicates they are willing to admit them so they can learn," Carlos Mercader, the executive director for the agency tasked with representing the island's government on the mainland U.S.
San Juan Mayor Carmen Yulin Cruz, a critic of the federal government’s response to the storm, said in a statement to ABC News: “The report proves what was evident to all in Puerto Rico." On Saturday, FEMA responded to media reports with a press release called “The Full Story” regarding the after-action report. The six-bullet rebuff of press accounts fires back at headlines saying the agency was “uninformed,” “understaffed and was [unexpectedly] forced to rely on staff from other agencies to fulfill its mission,” and that the agency admitted failure during the hurricane season.